It was a really bright day followed by drizzles in evening. Forest was filled with sweet damp smell of soaked grass and leaves. Spotted deer herds arrived on their favourite night halt spots near reception and around the cottages. It seemed to be triggered by drizzles. Every creature arrived on their resting and feeding patches early tonight. First were the Longoor monkeys who settled down on heigh branches of Peepal and Crocodile bark trees. Then spotted deer herds arrived on their resting spots. Indian palm civet, Flying squirrels and Insect eating bats were busy hunting down their prey. Even Mouse deer peeped out from thick undergrowth of lantana bushes. We noted these activities during moonlight safari. Surprisingly even forest owlet appeared on window of my room. Till 10.30pm it was suspiciously silent. Even frogs, night jars and owlet on my window were quite. And then, first Sambar deer bellowed an alarm from Acacia bushes 25m away from reception area. Then as usual spotted deer alarm calls filed the atmosphere. Their sharp resonating alarm calls, aaouw,..aaouw got dissolved in the mist. But this rocking music of shocked deer was on for complete night. Next morning made me realised that I am in Nilgiri mountain ranges and how it appears in winter season. At twilight surrounding was full of mist and it was hard to see anything beyond 15feet. As I reached Peepal tree near reception, I saw one of our guest Mr. Sushant Bhat was waiting for me. He hurriedly came towards me and yes from expressions I guessed it right. In Sushant’s excited words “Sid! I saw a leopard here, just a moment ago!” gave me most satisfaction. Yah, I missed the sighting but all my predictions based on alarm calls, I was able to track down moment of most cunning creature in our surroundings. Again our leopard continued his reputation. It got disappeared roughly for a week. Episode of bright day and drizzling evenings was repeated on 10th October. It was almost 8.00pm and unusually dark as sky was blanketed with clouds. After covering a usual track nearby coffee plantations and a small stream our gypsy was on the clear grassland patch near the lakeside. It was usual sight, herd of hundreds of spotted deer settled down for their night halt on grassland. It’s a simple logic, if such a scene makes us feel nice and our immediate response is, Wow! It is also going to tempt predators too. With at most care I was scanning landscape with search light. Yes! Once again I was able to locate the Ghost. I could recognise a silhouette of predator sitting just behind spotted deer herd. It was amazing to see a beautiful yellow coat with black spots almost flattened on ground. I asked Subin to stop the gypsy. And asked him to come out and hop up in backside as he was not able to see the spot clearly from driving seat. Now it was a beginning of tricky moments. First of all seeing a big cat at night and that to in open surroundings and when you are in open Gypsy is really thrilling. So, it’s difficult to ask guests to hold on their nerves and excitement. Then guessing further steps of action so as to have a closest possible look of this big cat without interruption is next challenge. And guiding a driver to right spot through slushy grassland and without missing out sight of the predator adds to the difficulties. But it’s a part and parcel of Naturalist’s job and I enjoy it. Within moments we were 5 meters away from herd and 20 meters away from leopard. All of a sudden Leopard charged on deer and again frightened deer spread out giving out their alarm calls. 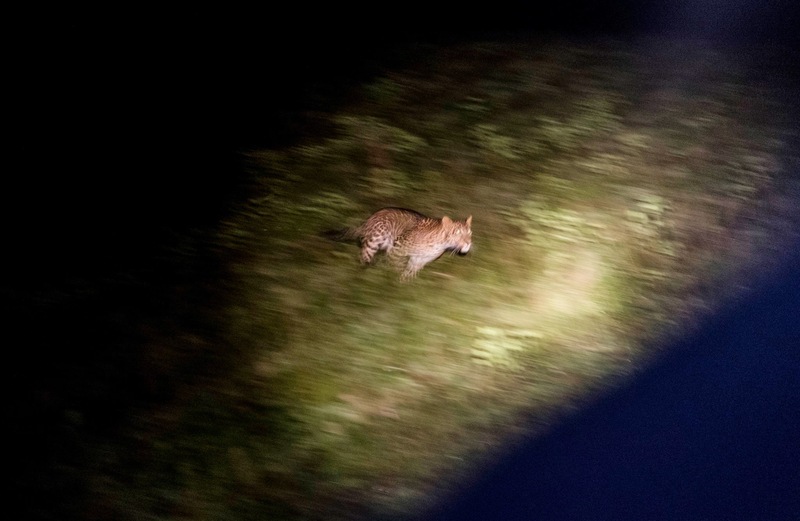 It was an astonishing moment to see a leopard attacking deer with lighting sprint. What we experienced was once again dissolved in surrounding thickets and dark curtain of jungle night. Still by looking at deer and direction of alarm calls, we could track down leopard’s moments within bushes. While we were returning to resort still our ears were catching faint alarm calls and I am sure everyone was rewinding the scene what we experienced just few minutes ago. It was great that this time one of the guests got the video of this thrilling wild scene. Mr.Padmanabhan got a really fabulous shot of leopard in sprint. Whatever we do wherever we live we should connect ourselves with this amazing world of marvellous creatures. It’s all matter of chance and luck but to make it better our jungles should be alive enough!